My little LEGO enthusiast (who now has a most difficult time leaving his room as that would mean parting with his LEGOs) is a big fan of the following books, both published by No Starch Press. 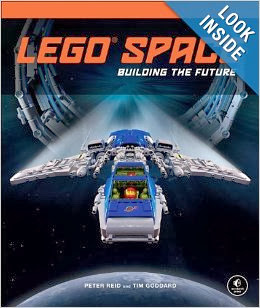 If you are looking for a more unique gift for the LEGO lover in your life, but don't necessarily want to add to their Tiny Pieces Collection, then you might want to consider one of these titles. The LEGO Adventure Book, Vol. 2 provides even more ideas for the young LEGO builder to copy. Just as is the case for Vol. 1, there are roughly 100 models contained in this book with "brick-by-brick" instructions. While there is no guarantee that the reader of this book will have all of the parts contained within these pages and used for constructing this particular models, the building concepts will serve them well. The reader can substitute their own pieces (when possible) or be encouraged to develop their own imaginations and build their own models. 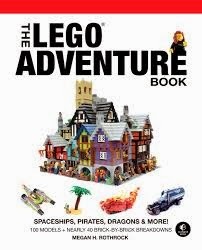 The LEGO Adventure Book, Vol. 2 is full of good guys and bad guys, castle towers and tudor houses and every so much more. Instructions for building are laid out in a numbered manner much like you'd find in a LEGO instruction booklet. Definitely a title worth checking out! My son absolutely loves this book! The book eventually transitions from fact to fiction. The transition occurs post-2012 when the mars rover landed. From there the book jumps to possibilities in 2069 on. Federations. Settlements on the Moon. That sort of thing. Lots of "what ifs?" dreamed up with LEGO models. The majority of the book is a fictional, futuristic tale of life in space. A story accompanies both photographs of models as well as design instructions for making the spaceships and vehicles for yourself. As I mentioned, it is not about Star Wars or Star Trek, a fact that I rather appreciate. I don't really want to focus so much on those particular stories but would rather my son create models using his own imagination instead of borrowing the already-imagined-thoughts of others. Personally I think this is a fantastic and inventive title. I can't really say what my son thinks of it but I can tell you that he's been pouring over this book since it arrived at our house. I guess that speaks for itself. Many thanks to No Starch Press for sending the top two titles my direction in order to facilitate this review. I have received no additional compensation for this review and all of my opinions are 100% my own. @Bekahcubed - Well, it's more fiction than non. (It just starts out non.) But it's definitely better for non-trademarked pre-set designs and prompts more free-style play. My guys would have loved these. They loved Legos and anything space-related.